American Dietetic Association (ADA) Sanctions Vegetarian Diets: Will Americans Follow? The American Dietetic Association (ADA) has long stated that appropriately-planned vegetarian and vegan diets are appropriate for individuals at every stage of the life-cycle, including pregnancy, lactation, infancy, childhood, and adolescence. Just recently though, the ADA released an updated position paper in support of vegetarianism. The new paper focuses more on vegetarian nutrition, bone health, and information on how vegetarian diets can prevent and treat common conditions, including cancer, ischemic heart disease, hypertension, obesity, and type 2 diabetes. The ADA points out that a vegetarian diet can meet the recommendations for protein, n-3 fatty acids, iron, zinc, iodine, calcium, and vitamins D and B-12, as well as other essential nutrients, and estimates that the number of vegetarians in the United States will increase over the next decade. This is great news, but I can’t help but wonder, with all the health benefits of a vegetarian diet--not to mention the ethical and environmental aspects of vegetarianism--why aren’t more Americans kicking the meat habit? One reason might be that certain foods, including meat and cheese, contain addictive chemicals that keep people coming back for more…and more…and more. In Breaking the Food Seduction: The Hidden Reasons Behind Food Cravings—and 7 Steps to End Them Naturally, Dr. Neal Barnard, the president of the Physicians Committee for Responsible Medicine, explains that meat and cheese, as well as sugar and chocolate, contain opiate-like substances that keep people hooked—and unhealthy. I can’t think of any reason why anyone wouldn’t want to eat healthful, compassionate, green, great-tasting foods, so perhaps the ADA’s reassurance and advice will give people more incentive to go vegetarian. 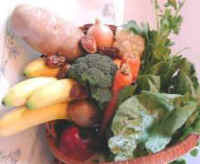 If you want tips on eating a nutritionally-balanced vegetarian diet, see the Vegetarian Resource Group’s Web site at www.VRG.org, or visit www.GoVeg.com for a free vegetarian starter kit. For hundreds of vegan recipes, visit All-Creature's RECIPE BOOK.